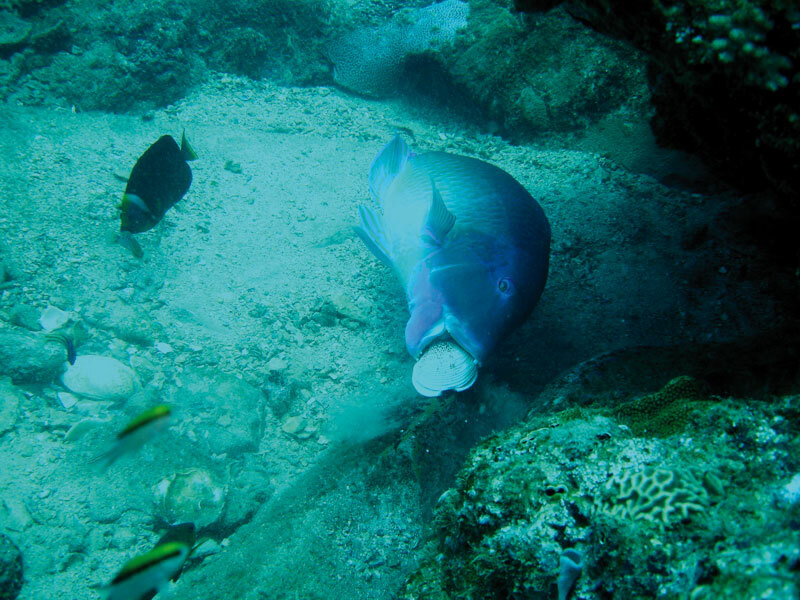 A black spot tuskfish using a rock as an anvil to open a cockle shell. Broken shells are seen lying on the sand near the rock. The first clear evidence of tool use in fish has been discovered by chance. Scott Gardiner, a keen diver who was swimming in the Keppel region, witnessed a black spot tusk fish using a rock as an anvil to break open a cockleshell. He took several photographs. For a long time tool use was considered a defining trait of humans. However, since Jane Goodall reported it in chimps the use of tools has been observed among dolphins, crows and even octopi. Brown says there has been debate as to whether water can count as a tool, such as when angler fish spit water to knock insects from the air. Brown says that tool use is a challenge under water, particularly for fish lacking hands. However, the tusk fish in question seized a mollusc in its mouth, moved to a convenient rock and swung its head violently back and forth until the shell broke open. Understandably Brown is keen to return to the site, this time with video cameras to see if the behaviour is unique to a single individual or even a species. Tusk fish are a species of wrasse common across the Indo Pacific, and are named after their large teeth. Like other wrasse they have complex social structures that may have encouraged the development of intelligence. Brown says he is also keen to test their cognitive skills.